Lean Cuisine meals are tasty and convenient frozen meals to have on hand for busy times and for when people are not well. Chicken curry has good flavour and the size is ample. Lean Cuisine’s steam chicken curry is very nice for a pre-packed meal. It tastes delicious and the chicken is plentiful and melts in your mouth. It’s very handy for a quick, easy, and tasty lunch. Lean Cuisine chicken curry makes a easy and quick lunch that tastes good and it hits the spot,l stock up when on special and they are so handy. An easy and satisfying meal on a weeknight. I loved it. The flavour of the curry was spot on for a frozen product, the vegetables also cooked perfect, but the best part was knowing I was being good to my body with the addition of both the brown rice and quinoa. I loved this!! The chickpeas were still firm and hadn’t turned to mush and the chicken tastes like real chicken not the processed stuff. Lots of different textures with the grains and legumes makes this taste great! 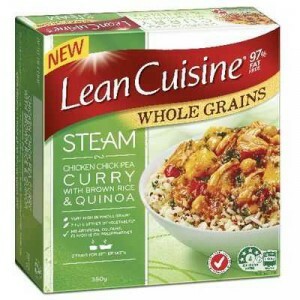 How would you rate Lean Cuisine Steam Chicken Curry?